From The American Spectator. August 27, 2007. This was the moment when anybody under 25 knew that the value system with which they [sic] had grown up was history. Caution, sexual reticence, patient acquisitiveness and all the hallmarks of a decent life, as defined since the Victorian era, suddenly looked bogus. By one of the cosmic strokes of luck that marked their career, the Beatles chose this instant to release an album that straddled the emerging rift. This same propitious moment also closely coincided with Mikhail Bakhtin’s Rabelais and His World, which first introduced us to the distinction between official and unofficial cultures. Bakhtin saw the two as a sort of cultural yang and yin, eternally existing and eternally opposed. The official culture is serious and stresses those allegedly "Victorian" but really much more universal "hallmarks of a decent life" mentioned by Mr Sandall — as well as piety, patriotism, honor and self-sacrifice; the unofficial is humorous and mocks these and other pieties of the official culture. It stands for self-indulgence and unrestraint in the pleasures of the flesh. The official culture saves, while the unofficial culture spends; the official culture urges us to look to tomorrow; the unofficial tells us to live for today. But approximately between the release of "Sergeant Pepper" in 1967 and that of Star Wars a decade later, our culture saw a stunning reversal. The official became for all practical purposes unofficial — that is, a merely private and voluntary indulgence for the few who continued to entertain a masochistic taste for self-denial — while the unofficial went public and official, becoming the new credo of the majority. Even those former bastions of the official culture, the state and the church, for the most part abandoned their former advocacy of virtue, discipline and sacrifice and tacitly permitted where they did not positively encourage the new individualism and self-indulgence. That’s the world we’re still living in, a world in which politicians respond to national emergencies by urging us to go shopping and churches admonish us only to prosper by seeking out "God’s best plan for your life" and reprove no sins unless they are sins against the environment — or discrimination against homosexuals. Both "Sergeant Pepper" and Star Wars "straddled the emerging rift" between old and new by adding to their advocacy of the new a gentle nostalgia for the old. In Star Wars it was the reminiscence of Flash Gordon and other kiddie science fiction or westerns from decades before, but rendered harmless by a frankly fantastical context. In "Sergeant Pepper" it was the vaudeville notes struck in the title track, "Being for the Benefit of Mr Kite" or "When I’m Sixty-Four." Like the bandmaster uniforms worn by the Fab Four on the album cover, these were all excursions into what was then beginning to be called "camp" — that is the unofficial’s hollowed out and mocking version of the icons and values of the official culture. The mockery, here as elsewhere, was part funny and part poignant, but its main purpose was to make the point that these former objects of admiration or veneration were, as Mr Sandall says, "history." Decades later, the now-official unofficial culture that was once so shocking and delightful to youthful revolutionaries has taken on some of the staidness and solemnity of its predecessor by celebrating its own anniversaries and commemorations. These things — indeed, you might almost say memory itself, at least in the form of tradition — are inherently official. The anarchic and self-indulgent unofficial culture, as it used to be anyway, lived only in the present and had no use for such things. But now those who continue to celebrate the revolution commemorate and memorialize these milestones marking the way to the ultimate triumph of fun and fantasy over frugality and fortitude. A hundred years from now, musicologists say, Beatles songs will be so well known that every child will learn them as nursery rhymes, and most people won't know who wrote them. They will have become sufficiently entrenched in popular culture that it will seem as if they've always existed, like "Oh! Susanna," "This Land Is Your Land" and "Fr re Jacques." It certainly looks like it, I agree, but if this does happen it means that people will also have forgotten the difference between "I come from Alabama with my banjo on my knee" and "I’d love to turn you on." Perhaps in the future there will be no difference. The most stunning example to date of the unofficial’s becoming official was the record-setting opening over the Memorial Day weekend — what exquisite timing! — of Disney’s Pirates of the Caribbean: At the End of the World, which made $401 million world-wide, or about $100 million a day. Pirates — the 17th century, Spanish Main kind — have of course been figures of fun at least since Barrie’s Captain Hook, who recently celebrated his centennial and who presumably inspired the Disney theme park attraction which has in turn inspired (so far) three cinematic blockbusters. But until relatively recently these camp pirates have been contained within their pirates’ camp. The background of the official culture allowed them a space apart as lords of misrule, exercising sway, and then only for a time, in Neverland. The new pirates may be at the end of the world — in more ways than one, some would say — but it is meant to be our world, since there is no other. 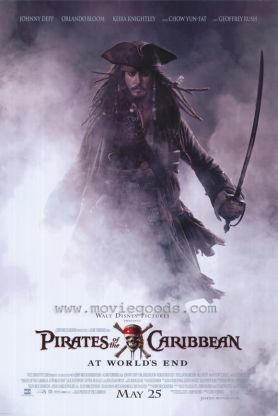 Piracy has gone mainstream, along with the Beatles’ paeans to drug-taking — as we can also see in the permanently drugged-out Captain Jack Sparrow (Johnny Depp) and the cute idea of bringing in to the new Pirates, Mr Depp’s own role model, Keith Richards of the Rolling Stones, in a cameo role. "With Johnny Depp back in theaters shivering his timbers," writes Andrea Sachs in the "Escapes" column of The Washington Post, "you may want to get in touch with your inner Blackbeard." She’s giving a puff to a couple of entrepreneurs in Maryland who are offering what purports to be the pirate experience to small children. "For the rare child who doesn’t already think he’s a pirate, the company provides the necessary props: scofflaw name (Angry Alex, Insane Ishmael), gold hoop earring, Vegas-style vest, painted body art of a mustache (curly, straight or mean), scar, skull and crossbones, etc." The pirate adventure she describes involves children — "ages 3 to 10 ideally" — being encouraged to shoot rival pirates with water guns in order to gain access to a hidden treasure. "When the treasure was found and hauled up, [the organizer] instructed the kids to defy the Golden Rule of Parenting: Don't share. Grab the goods and stuff your pockets." This is a very fair approximation of the pirate’s credo in the movie: "Take what you can; give nothing back." It’s all good wholesome fun, of course — as well as an indication that they must be racking their brains, back in the Disney boardroom, trying to figure out how to put the Mouse’s damnable copyright on piracy itself. Still, I don’t suppose that most parents would find it harmless if they thought there was the tiniest smidgen of reality about Mr Depp’s glamorous pirate. That’s why they bring him — as well as Geoffrey Rush’s Captain Barbossa and others — back from the dead. Or why little Keira Knightley can fell fearsome (male) pirates twice her size with every cut of her deadly blade and still have enough breath left over to pronounce her wedding vows to Orlando Bloom at the same time. Or why a thousand other impossibilities are made routine. Fantastical pirates are safe pirates, and they leave us to chortle along with our ten-year-olds over Captain Jack’s splendid selfishness. Parents presumably think their children insulated from bad moral lessons when the pirate of their admiration spends more time battling zombies (as in the first in the series) or mutants (as in the latest) than robbing respectable citizens of their hard-earned property. But the film still manages to commemorate, in its own way, the triumph of the unofficial culture over the official by stressing the reversal of the two. The pirates here are as certainly the good guys — or at least the cool guys, which is as near as we are allowed to get to good anymore — as the British soldiers who catch and execute them are the bad, or uncool guys. In a movie otherwise as chaotic and incomprehensible as it can well be, that’s the one thing that stands out with crystal clarity. It’s also the point of the opening sequence, which depicts a grim scene of mass hangings, including hangings of women and children, carried out by British authorities. These are accompanied by an announcement of the suspension of civil rights, just so (I take it) that the film can remind us of the moral universe out of which it issues with an irresponsible allusion to the Patriot Act. Oh, well. Perhaps in Fantasyland terrorists are as warm and cuddly as pirates.